RAILROAD.NET • View topic - HICKSVILLE-RONKONKOMA ELECTRIFICATION 1987-2007 20 YEARS! HICKSVILLE-RONKONKOMA ELECTRIFICATION 1987-2007 20 YEARS! Everyone: It is hard to believe but the Hicksville-Ronkonkoma Electrification is 20 in 2007! The project started with the June 8,1985 TT change. Midday service was replaced by buses E of Farmingdale as well as reduced evening service-just 3 EB trains after 7PM. The last EB train-#210 left NYP with an 11:39 connection leaving JAM at 12:02am arr KO at 1:12am. This was judged too early for many-with the 7/8/85 TT change it was changed to leave NYP at 12:10 am;leave JAM at 12;32am and arr KO at 1:42 am. At first rush hour and weekend service was unaffected - the only weekend adjustments were occasional shutdowns due to pivotal track work. Later in 1985 the LIRR began to drop third rails for installation on the right of ways. The first change was the close of Grumman station at the end of 11/85-I rode the last train to stop there-the 4:29 pm from KO WB. In 1986 construction progressed with the biggest change occuring with the TT change on 10/27/86. on that date the high level platform stations at Wyandanch,Deer Park and Brentwood opened and the old stations at Republic and Pine-aire closed. In 1987 the first stretch of electrified track opened for business-the short stretch from Hicksville to Bethpage was powered for the first time on 4/25 and service began on 4/30/87. This stretch was to 500 feet W of the Meritts Road crossing and the 1000 feet Central Branch stretch at B tower-used to turn the electric runs to BPG. With the TT change on 6/22/87 electric service then ran to Farmingdale-FARM 1 and 2 locale. The Bethpage electrics totaled 4EB and 5 WB and the Farmingdale service totaled 6 trips each way on WEEKDAYS only. Later in 1987 the new Central Islip and Ronkonkoma stations opened in their new current locations.Towards the end of 1987,electric service began to KO on an interim TT on 12/28/87 - 2 AM and PM Peak electric trains as well as a WB run at 8:00pm. This lasted for three weeks until full service began on 1/18/88 - just over 19 years ago. As many know it was a success from the start-KO ridership increased 60% from 1972 to 1986 - it was projected to be 13,500 AM RUSH WB by 1990-this was achieved within 1988. The latest AM rush total I have is 16,570 in 8/2003. Last edited by MACTRAXX on Thu Dec 27, 2007 9:02 pm, edited 6 times in total. Would love to see a print schedule of some of this if someone can scan one in or knows a website to see any of it. Research and typing courtesy of my friend, "UN Block"
I forget who the Engineer was on the first westbound Rush hour train out of KO, But I can tell you the Conductor was Benny Prince, and the Brakeman was yours truly. There were Rail fans on the train that day asking us to sign their tickets. If anyone has one, please post it, i would love to see it! wow, interesting stuff, thanks for typing it up. Did Ronkonkoma always have 3 platforms since going high in 1987? I know that carwash just east of the station was added pretty recently. Ronkonkoma started out with an island platform. The outer stairs went to the ground. The temporary ticket office was on the ground (IIRC) on the south side of the tracks until the permanent structure was built several years later. This shot is 1987, just before activation of the third rail. This one caught me by surprise. I was with AIL in Deer Park until 1975. At that time the LIRR went through our backyard, just about, and the Alco C-420's were in charge. So no third rail. From what I see, in 1987 a third rail went in and now the Comac Rd crossing has got to have a gap for the third rail. I still remember the day that some kids placed a rock in the frog of the switch going to the Pilgrim facility and the train wound up on its side. Interesting memories of the area. Was anything done to improve the station at Deer Park ? And is the area still single track ? Deer Park station, as you remember it, is no longer. The station located at Long Island Avenue and Deer Park Avenue was closed and moved about 2 miles east in what is now Heartland. It's about 500 ft or so from where the old Pineaire station was. It's definitely one of the more popular stations in suffolk because of it's large lot, and free parking. It's packed to capacity everyday, with cars often parking on the grass. On another note, AIL is no longer either - bulldozers were in there last week tearing down the remainder of the main office building. Construction of Tanger Outlet Mall begins in the spring. If you remember where L. I. Avenue did a dog-leg jog across the tracks, going from north side of LIRR to south side of LIRR just before the Pilgrim spur, THAT'S where the Deer Park Station was relocated. Many kids tried to race the train at that crossing years ago and got clipped. No more dog-leg jog anymore. The road was diverted north of the huge parking lots, then turns south to cross the tracks to connect with L. I. Avenue on the south side. The old Deer Park station was left standing for MOW (?) use. Don't know if it's still around or not. As an historical aside: The relocated Deer Park station is on the northwest side of the crossing. 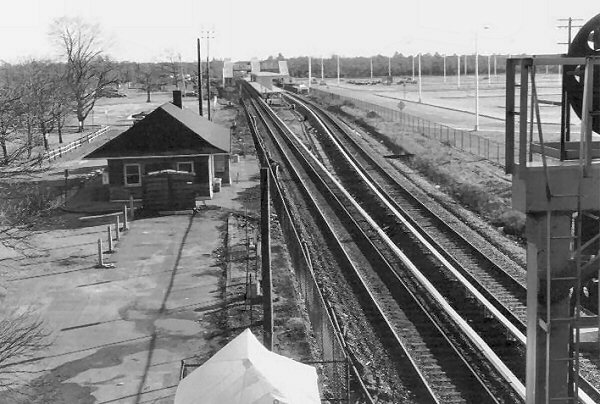 The old Edgewood station was located on the northeast side of that same crossing many years ago. Opened in June, 1892, it was discontinued as a stop on 10/21/1913 and stood around vacant until it burned in 1920. The late, retired station agent /block operator George G. Ayling of C.I. told me years back that anytime anyone needed a small supply of construction materials, they just tore it from the remains of the abandoned Edgewood depot. Wonder if the LIRR intentionally burned it . . . . Hmmmm . . . . .
Also, on the subject of relocated stations, CI was moved east to the corner of Suffolk and Lowell Avenues, the former site of the conection into CISH years back. Talk about things changing radically with time. Is the Deer Park area double tracked, besides having a third rail ?? Hard to believe AIL is gone from Deer Park. Did they close their doors completely or do they still operate the Melville and Farmingdale facilities ? The Deer Park facility was actually three stories. They played a game. They dug down to provide a basement, one story, they had the original floor, with the lobby and waiting room, second story, and the third story was built over the experimental machine shop. That is where all the planners and "great politicians" were located. When I left them (escaped ?) they were part of Cutler-Hammer. Later on I found out that Eaton had taken them over. What is left of that complex ? As an aside, there was a Hobby shop across the tracks on the North west side. They folded, as many businesses in the area did, and I came by when they were getting rid of whatever inventory they had. Picked up, in HO scale quite a bit of goodies. Got my Tuscan Red GG-1 and my Brunswick Green GG-1 there, at the interesting price of seventeen bucks apiece. Try that today. The old Deer Park station is still there, used by Lipa IIRC. Outer Platforms were added, and placed in service in 1993, and the new station building opened for business in 1996. The north lot was built in 1994, and the garage was built and completed in 1995. This was to alleviate the overcrowding at KO. Are you POSITIVE about your dating of the parking garage and new station buidling? I've been given dates of the garage opening in 1996 and the new depot in 1998. I need to know which is factually correct to update my LIRR Station History listing. I am pretty sure that the railroad still uses the old Deer Park facility, I happen to live a few blocks away and always see LIRR trucks there.